v.mkgrid - Creates a vector map of a user-defined grid. v.mkgrid creates a vector map representation of a regular coordinate grid. Point, line, and area vector grids can be created. Grid points created with the type=point option will be placed at the center of each grid cell, like centroids with the default type=area option. Grid lines created with the type=line option will be identical to the edges of each grid cell, like boundaries with the default type=area option. The resultant grid can be rotated around the origin (center of the grid) with the angle option. Optionally hexagons can be created with the -h flag. 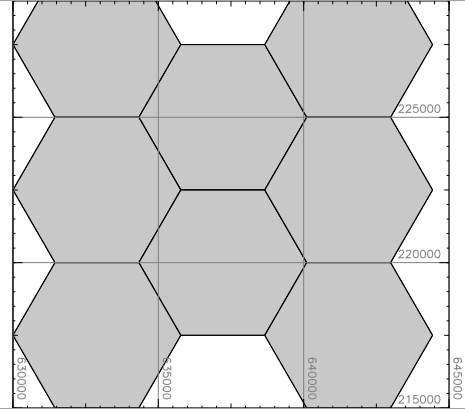 Hexagons are by default symmetric. Asymmetric hexagons can be allowed with the -a flag. This module is NOT to be used to generate a vector map of USGS quadrangles, because USGS quads are not exact rectangles.